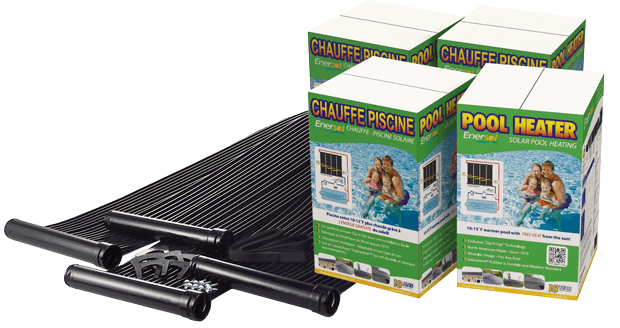 Use this Sizing Calculator to help you determine the number of boxes of Enersol Pool Heaters needed for your installation. Panels are approximately 1 foot wide (12.5 inches from clip to clip approximately when the panels are installed) and they come in many lengths. The most common lengths are 8 feet, 10 feet, and 12 feet. Custom lengths are also available in 1 foot increments from 6 feet to 20 feet long. Check our Guide to maximize your roof/rack area. and extend your pool season for more family fun! How many Enersol Pool Panels do I need? Measure the roof area available to be sure the panels will fit when using the sizing calculator. Panels must be positioned vertically from eave to peak with at least 6 inches space around the panels. This space is for plumbing and work space. Check our Guide to maximize your roof/rack area. 1 Enersol System Installation Kit per system*. *Additional 2 Adapters and 2 Plugs are required per bank when splitting the system into two or more banks of panels. You can find any Enersol part and kits in our Enersol Parts & Accessories page or PVC piping and fittings in our Black PVC Pipe and Fittings page. If you have further questions, Contact Us and we will be happy to assist you. Enersol solar pool heating is a registered trademark of Enerworks Inc.